I adored The Secret of Ella and Micha, book one of the Secret series and was excited to delve into The Forever of Ella and Micha. 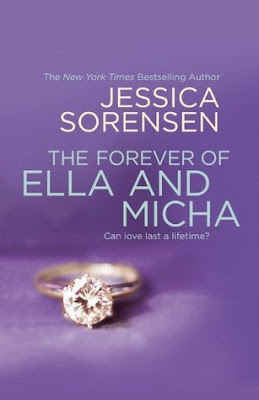 While I felt the tale could have ended with book one, Sorensen provided a heartwarming, gut wrenching sequel and once again had me swept up in the story of Ella and Micha. Three word review: breathtaking, bittersweet, intense. The tale picks up with Ella in college and Micha miles away touring with his band. Managing the long distance relationship, her father’s rehab and her own fragile emotional state have Ella confused, and fearful of dragging Micha down with her messed up psyche. The tale that unfolds is intense, heartbreaking, beautiful and raw. Ella struggles and finds growth in this novel. I am so glad that the author chose to have Ella seek professional help, and appreciate its focus in this novel. So often the characters are left to their own devices and this more realistic approach may one day impact a reader. Despite her issues and her struggles I connected and wanted her to be happy. She is so much stronger than she gives herself credit for. Micha is smexy, and just oozes with swoon-worthy goodness. He has his own issues, and sometimes I think his happiness centers on Ella too much. I do respect that he accepts her; mood swings and all. He has patience with her, and makes career decisions with her in mind. He doesn't push her, even when it hurts him not to. Family is present in this novel but this time we see some growth and healing. Both Ella and Micha have great best friends. I really like how supportive Lila and Ethan are. True friends indeed, they aren't enablers and speak out when necessary. The two work in tandem to help the couple and I cannot help but hope a little something is brewing between them. Sorensen has this way of wrapping you up in her characters so that you feel their emotions. Despite how impossible the relationship seemed, you couldn't help but root for them. When they are together the world seems brighter. They are the couple you notice in a crowded room from the sexual tension to the devotion you see as they gaze at it each other. There were painful moments, romantic moments and hot sexual moments that melted the words as I read them. Sorensen touches on depression, anxiety, dysfunctional families and alcoholism. She doesn't gloss over them, or try to magically fix them; instead she weaves a realistic and educated thread into her tale. I devoured this in one sitting with its dual POV’s and closed the book with a sigh and a smile. I recommend reading The Secret of Ella and Micha before reading The Forever of Ella and Micha, although this would work as a standalone. Fans of Beautiful Disaster will love the series. The Temptation of Lila and Ethan is the next book in the series due out in October 2013 and I am excited to read their story.